Born in New York and raised on Maui, Dylan Schwarzmeier is currently working toward a Bachelor of Applied Science in the field of Engineering Technology at the University of Hawai’i Maui College. 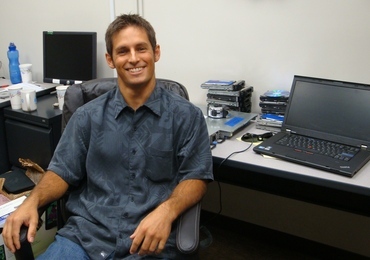 Dylan’s ultimate goal is to work in a cutting-edge technical career on Maui that would support a comfortable lifestyle. When he is not busy with school or work, Dylan can be found windsurfing somewhere on the north shore of Maui. Due to the spatial resolution limits of current satellite-tracking systems, successful imaging of satellites within a geostationary Earth orbit (GEO) has never knowingly been performed. The scenario of a malfunctioning GEO satellite, prompting a long costly damage assessment, could be mitigated by a visual assessment of the satellite. Shadow imaging proposes an inexpensive solution to this problem by capturing the diffraction pattern created from a satellite occultation. When a satellite passes between the Earth and a specific star, a shadow of the satellite can be observed from Earth in the form of a diffraction pattern. By utilizing an array of inexpensive mobile 14-inch-diameter telescopes equipped with rapid readout photon counting detectors, the diffraction pattern created by a satellite’s occultation can be measured and mapped. The diffracted silhouette of the satellite can then be processed in an algorithm that corrects for diffraction to produce a high-resolution silhouette of the satellite.